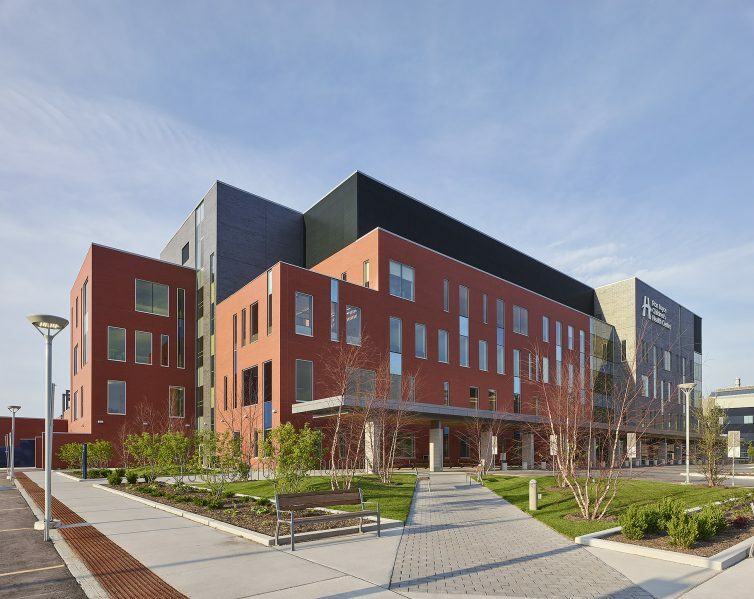 The Ron Joyce Children’s Health Centre achieved LEED Gold primarily through the engineering team, which set local, reused and recycled content guidelines, instituted energy-saving mechanics and technologies, and tightened the building’s thermal envelope. 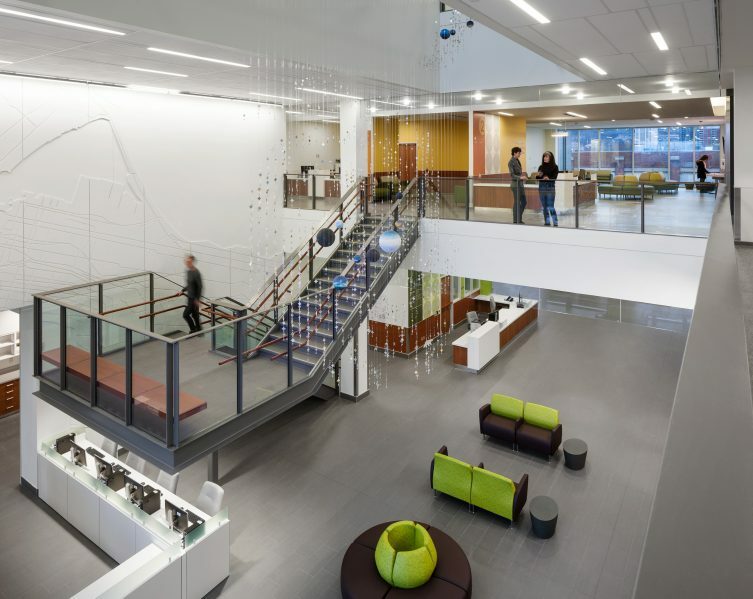 The interior design team’s contribution included zero PVCs, low-to-no-emission materials, and recycled content such as the office space’s Net Effect tiles from Interface. Think for a minute how much you don’t enjoy visiting the hospital. Then multiply that a thousand-fold for kids with long-term health issues. 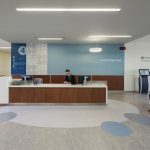 When it came to creating a four-storey outpatient centre for children, youth and young adults– the first of its kind in Canada – Hamilton Health Sciences had a long list of requirements for its designers, not the least of which was that the place be made as inviting and non-clinical as possible. 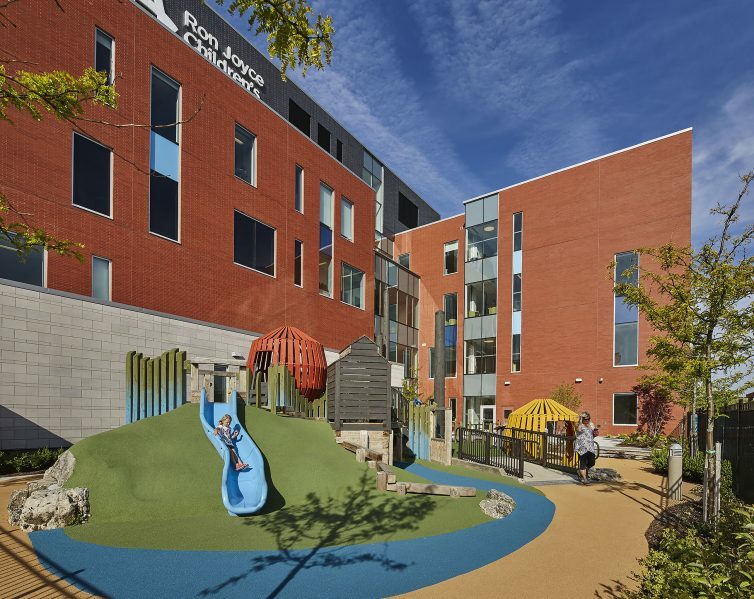 The recently opened Ron Joyce Children’ s Health Centre (RJCHC), named after its patron, the billionaire co-founder of Tim Hortons, houses a variety of programs and health-care services within its 204,500-sq.-ft. environs. 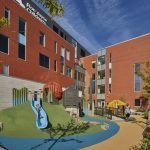 A stand-alone offshoot of McMaster Children’ s Hospital, one of the top pediatric academic health sciences centres in the country, RJCHC welcomes myriad young people and their families from Hamilton and the surrounding Southwestern Ontario region in need of long-term services, recurring treatment and progress monitoring. 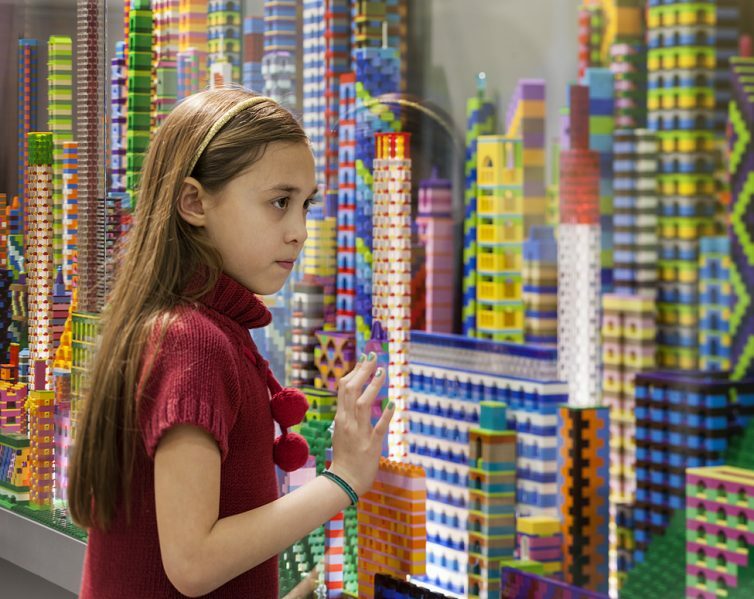 n arts program, part self-discovery and part “positive distraction” for clients and their families, includes over 40 art installations from local artists, including this 17-ft.-long LEGO skyline, Kaleidoscope City, by Raymond Girard. 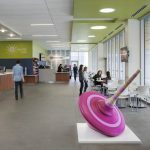 Four different programs, each on its own floor – Prosthetics and Orthotics, Developmental Pediatrics and Rehabilitation, Mental Health, and Autism Spectrum Disorders – were being brought together under one roof, in a purpose-built space that had to appeal to visiting children, their siblings and their parents alike. Wayfinding was important, as was a cohesive theme to tie everything together. The designers came up with the concept of “Journey, Discovery and Connection.” Journey speaks to the sometimes lifelong issues these children face. Discovery lies in finding out how to be their best, in addition to learning about the surrounding city of Hamilton. Connection talks to both the in-house and broader outside community, as well as biophilia – the human desire for close association with natural forms. A white-on-white 3D mapscape of Hamilton decorates the main wall next to the open staircase leading to the central Resource Centre. Hang-ing down from the fourth floor is an eye-catching sculptural creation by Moss & Lam, featuring glimmering globes and animalistic shapes on a series of thin wires. The designers interpreted biophilia in a variety of ways, from the use of natural colours and warm wood tones (“They offered a more sophisticated palette,” says Kenny, “not the regular ‘ kiddie colour’ bold primaries”) to patterning, such as animal shapes in the upholstery, and repeating ovals and circles in furniture pieces and flooring tiles. Even outdoors, in the ground-level accessible playground and outside terraces on every floor, the colours were kept complementary, further unifying the centre’ s look and feel. 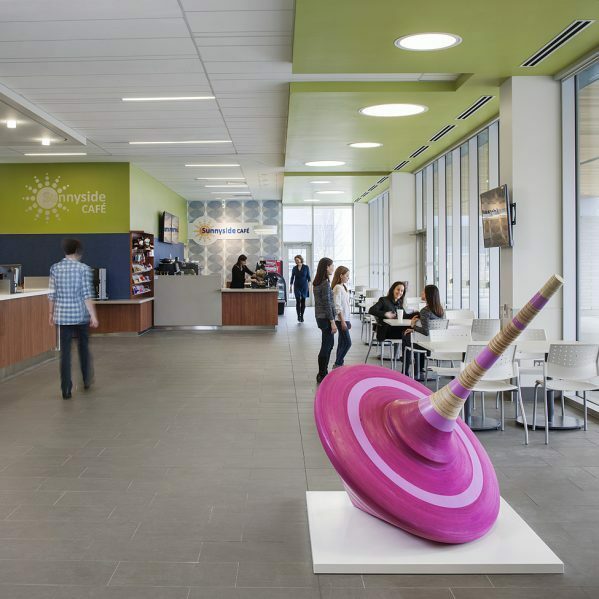 Twenty-six theme panels scattered throughout the building identify natural life in the Hamilton area, along with info on the location of parks and other amenities, augmented by factoids about the city’ s industrial past and vibrant arts future. Lessening user anxiety was an important concern. 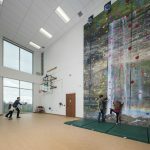 The centre’s outdoor gardens and play areas, plus plenty of light and a nature-based palette inside greatly aid this cause. Visitors are treated to magnificent north-south views of Lake Ontario and the Niagara Escarpment, respectively. 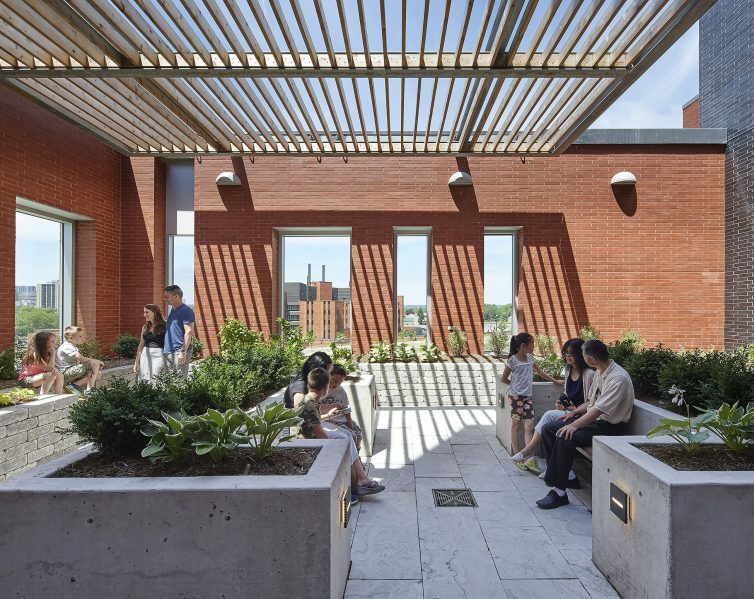 Enhancing the calming, natural light from 10-foot windows is light from a central well that extends full height through the two-storey Family Resource Centre and beyond. 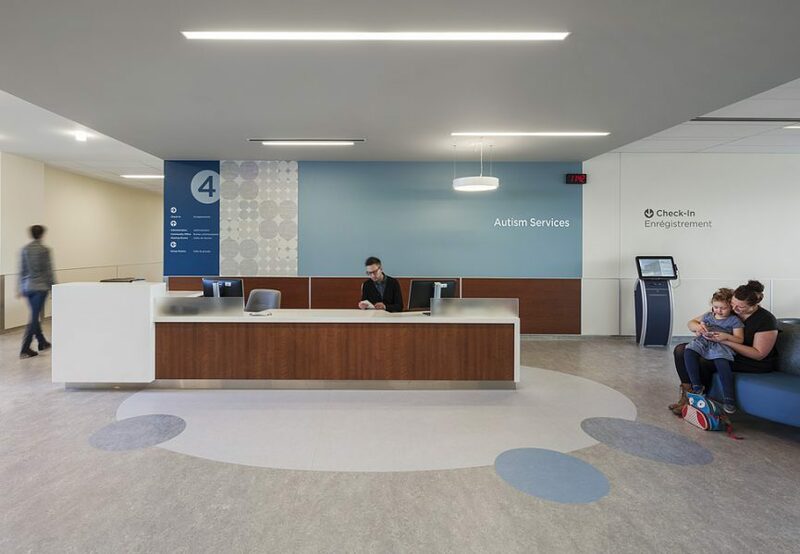 The staircase leading to this information hub is at once utilitarian and therapeutic, for clients undergoing rehabilitation or adjusting to a prosthetic limb. Like many other areas of the centre – the playground, the gym, even the hallways – ordinary space also doubles as a treatment place. Ena Kenny says staff and user reaction to the Ron Joyce Children’ s Health Centre has been “overwhelmingly positive.” Best of all are the comments from the kids, who used to feel scared or depressed when going in for therapy, but now find they can actually enjoy it. verything in the four-storey building, including the gym, has a dual normal-therapeutic purpose. 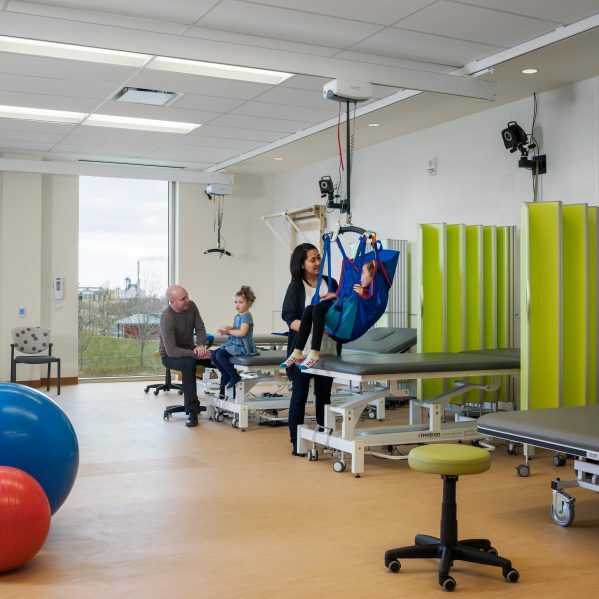 Even the necessary clinical areas provide “positive distraction” such as views through floor-to-ceiling windows, for kids undergoing treatment. “It was important that the spaces were uplifting and didn’t cause anxiety,” says principal interior designer Ena Kenny.